The Blue Bedroom Inn is located in the heart of downtown Savanna, Illinois above The Savanna Marketplace. It has four updated boutique style guest rooms. The Inn faces Main Street on the east and backs up to the Mississippi River on the west. 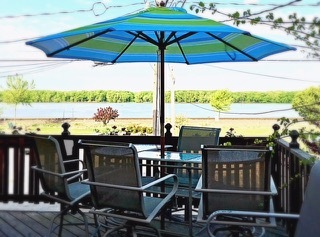 Enjoy shopping, wineries or exploring during the day and unwind on the Large back decks with a beautiful sunset over the Mississippi River at night. The Inn notes a spacious common area with a living room, dining room, and kitchen. Each room offers expanded cable, flat screen t.v.s, USB charging stations and much more for your convenience. The Inn offers Free 24 hour access to the Answer Fitness Center and Free bike rentals to all its guests. Savanna’s nightlife has something for everyone with casual dining and 9 bars on Main Street within walking distance from the Inn. Savanna is also centrally located to many outdoor activities and day trips for the naturist, sportsman and history buffs. Make memories with a group of friends or family or plan that romantic getaway. Reenergize your mind and body with a peaceful way of life and natural beauty at The Blue Bedroom Inn.